The father smiled too. His son was showing his love for him by his eagerness. The father displayed his love by his patience. 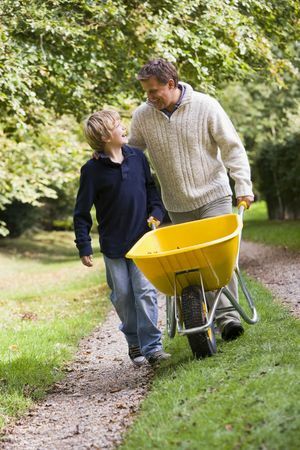 He knew his son was learning a skill, the value of work, and the joy of sharing in his father’s world. That statement seems strange to us. How different we are from children. Consider my four-year-old friend. Unlike an adult, he did not tell his dad what he thought needed to be done. He just watched and did what he saw his father doing. The boy did not provide the pine straw. He used the materials his father had brought. The tyke did not ask why the straw must be spread before the winter freezes came. He did not even have to be told to do the work. He wanted to be where his father was, doing whatever his father was doing. Why can’t we be more like that? Sometimes we make serving God into something more complicated than it is. If we would just trust Him more and worry about things less, our work would be so much easier. But to trust Him we must know Him. We learn of Him through His written Word, through prayer, and through sharing our lives with other Christian believers. Once we get to know God, we learn to pay attention to His leading in our lives. As we follow His lead, our service becomes a joy. When the Lord really puts a task on your heart, you can’t help but look forward to doing it. You live to do it. The joy of working for the Lord is not in admiring what we have accomplished, but in being connected with the God of the universe in an important enterprise. How important is pine straw spreading? It saved a flower garden from the snow last winter. The little boy did not spread much pine straw. That was not the point. He was together with his father and shared in the work. My prayer is that we will quit asking God to help us do our work, and start asking to be part of His. He knows what we should be doing. He knows how we should go about it and has made provisions for the challenges we will face. He just wants us to find joy in joining with Him in His work. Read 455 times	| Like this? Tweet it to your followers!